Joy Chakraborty, COO, PD Hinduja Hospital, speaking to the graduates of allied health sciences at the convocation ceremony. Mumbai-based PD Hinduja Hospital and Medical Research Centre has introduced two new courses — endoscopy and neurology — for its upcoming batch of allied health sciences students. The educational wing of the prestigious hospital and medical research centre celebrated the convocation of its 5th batch of allied health sciences course comprising a total of 78 students on Monday. The new batch of students was also inducted on the occasion. “The demand and supply gap for skilled professionals in the allied health sciences area is huge and we have always been at the forefront to help reduce this gap with the help of courses offered by our hospital. Today, I congratulate all the students for their success and wish the next batch all the very best, said Gautam Khanna, CEO, PD Hinduja Hospital and MRC. 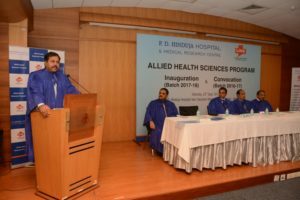 The fresh allied health sciences graduates were placed within PD Hinduja Hospital and MRC and in leading and well-reputed city hospitals ranging from Kokilaben Hospital, Wockhardt Hospital, Global Hospital, Seven Hills Hospital, Asian Heart Institute, etc. 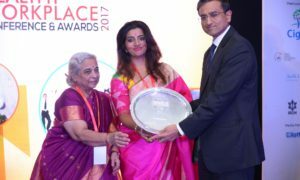 “I congratulate our current batch of students and wish them successful careers in our ever-growing healthcare industry, said Joy Chakraborty, COO, PD Hinduja Hospital and MRC. In December 2013, PD Hinduja Hospital became the first hospital to initiate courses under the Star Scheme by the Government of India and also affiliated itself with the Health Sector Skills Council – a non-profit organisation, registered under the Societies Registration Act, 1860. 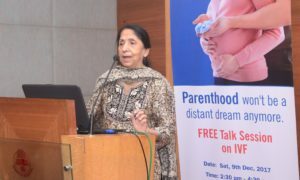 Through this affiliation, PD Hinduja Hospital and MRC, along with Lifesupporters Institute of Life Sciences (LIHS), conduct medical courses at the hospital. Under allied health sciences, the hospital provides courses covering Advanced Medical Laboratory Technician, Critical Care Technician, Dialysis Technician, Operation Theatre and Anesthesia Technician, Radiology Technician Certificate, etc. 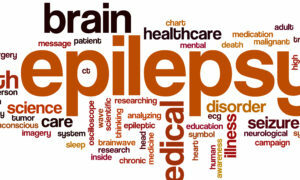 with an aim to close the growing gap of allied health professionals in the Indian industry. The duration of these courses is one year and is open for H.Sc pass/graduates depending on the desired specialisation. Do you really need that MRI your doctor suggested?